This Valentine’s Day, treat your loved ones to an exquisite dining experience at Lafite, the French fine dining restaurant at Shangri-La Hotel, Kuala Lumpur. Our culinary experts have put together a unique and lavish six-course dinner menu in conjunction with this special day, which is bound to ignite your senses and give you an out of this world dining experience. Dinner begins with three entrées, prepared to perfection. First on the menu, is the Seabass and Scallop Tartare consisting of citrus cured European sea bass, smoked Hokkaido scallop, tomato vinaigrette, mache salad and oscietra caviar. A creamy bowl of Crab and Lobster Bisque comprising of infused tarragon, lobster claw and brandy comes next, followed by a succulent plate of Irish Oyster consisting of steamed oyster ravioli with melted leek, pink peppercorn and trout roe. Mandarin Orange Sorbet is next on the menu. This refreshing citrusy goodness, served as a palate cleanser is bound to add some zest to delight your taste buds. The main course for the night comes with two options. Choose from the Veal 2 Ways which features roasted fillet of veal, 48 hours slow cooked veal cheek, truffle celeriac puree and morel sauce or the Red Seabream which comes with crispy skin seabream, grilled octopus, fresh baby spinach and seaweed butter. Seal your romantic dinner with a delectable helping of Chocolate Sphere, consisting of hazelnut rouge sphere and raspberry snow. 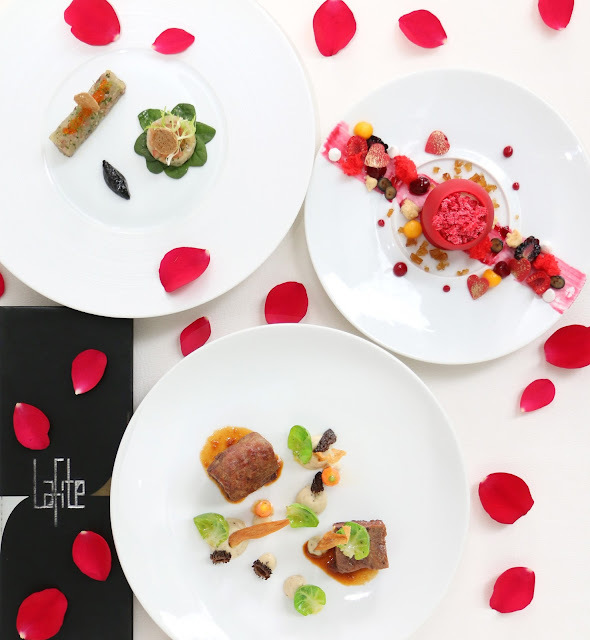 The Valentine’s dinner at Lafite is priced at RM 1100 nett per couple. M 35 nett, it will be available from now till 28 February 2017. For reservations or more information, call (03) 2074 3904 or email [email protected].